Not long after pianist/piano teacher Darden Burns moved to Bainbridge Island 31 years ago, she decided Bainbridge needed a quality professional piano and a place to play it. 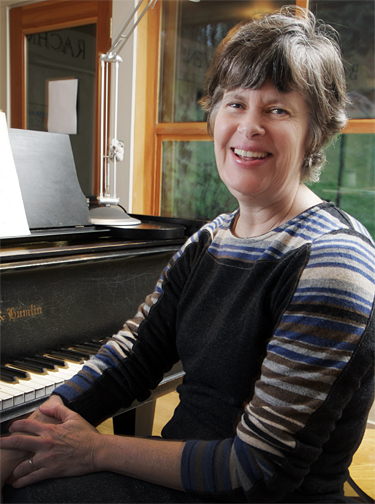 She formed a nonprofit called “Bainbridge Community Piano Association” (now partly funded through One Call for All) to purchase the piano and maintain it. Though it took her 5 years to raise $30,000 for the very special Yamaha C6 piano now installed at the Waterfront Park Community Center, it was worth it: the acoustics make the center a perfect location for concerts. Once the piano was in place, Darden established the First Sunday’s Concert Series. A mix of Darden’s favorite music styles — classical and jazz — the concerts feature monthly performances by high caliber jazz and classical musicians (excluding summer months). Though the concerts are not always on the first Sunday due to schedule conflicts, you can always check the First Sunday’s Concert website — http://www.firstsundaysconcerts.org — to find out what’s coming up next and when. On January 3rd at 4pm, Trio Pardalote, a dynamic women’s chamber music trio, will introduce the 2016 season for the First Sunday’s Concerts. Tickets are $20 ($10 for students). All ages are welcome. Credits: BCB host: Carrie West; BCB audio tech and editor: Chris Walker; Social Media Publishers Chris and Diane Walker.